What's wrong with the picture? What's wrong with the picture? I'll tell you what's wrong with the picture: how the heck old is that guy? He has got to be at least thirty years old, right? What in the world is a thirty year old man - or a twenty year old man for that matter - doing playing a Nintendo DS? 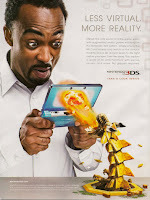 What's wrong with that picture - that full page magazine advertisement - is that Nintendo clearly sees a viable sales demographic for their video games in the over-thirty male crowd. If this is you, and I must speak rather directly here, you need to give up these games and I mean now. Or to phrase it like the bible does: you need to put away childish things: "When I was a child, I talked like a child, I thought like a child, I reasoned like a child. When I became a man, I put the ways of childhood behind me. "1 Corinthians 13:11. Where are the men? Are we becoming the nation of the man-child? I'm referring here to the "Omega Male." As opposed to the Alpha Male (or perhaps the Beta or the Gamma). This is the dude who will end up an unshaven, jobless slug inhabiting his parents' basement playing video games by himself or perhaps with other Omegas. He has no girlfriend or wife and no prospects - the girls hate his lack of discipline and laziness and self-centeredness - and they hate the video games. He'll come in last place because he refuses to grow up. If this is you, please, I beg you, put the game down for long enough to watch the clip below and repent. If you feel the tug on your heart to make some changes, then watch this sermon from Mark Driscoll. He'll slap you around a bit, but in the end you will thank him. If you won't give him the hour, at least read this article. Do I sound overly aggressive in this post? Will anything else get your attention? Yes yes yes yes yes...Living dangerously in the hands of God...Lord Jesus help me to grow up. Yay! I was right!! What's my prize?! It's funny, in our sermon Sunday, the teacher said this very thing, (among other things) "Where are the Men?" Isaiah 59 was the text. Also, you sound exactly like dad at the beginning of your rant. "What's wrong...?? What's wrong...??? I'll tell you what's wrong!" That's so dad. And, from a female perspective, he's right you gaming guys. NOT attractive. I want to forward this to my girls' youth group leader. Carol: you win a brand new Nintendo DS 3d! Now you can experience reality more virtually! Congratulations! I should add that I'm not opposed to men using the Wii to keep fit....my Dad needs his Wii every day to help his Parkinson's. I'm all for that. I think you get what I'm after with the post, right?